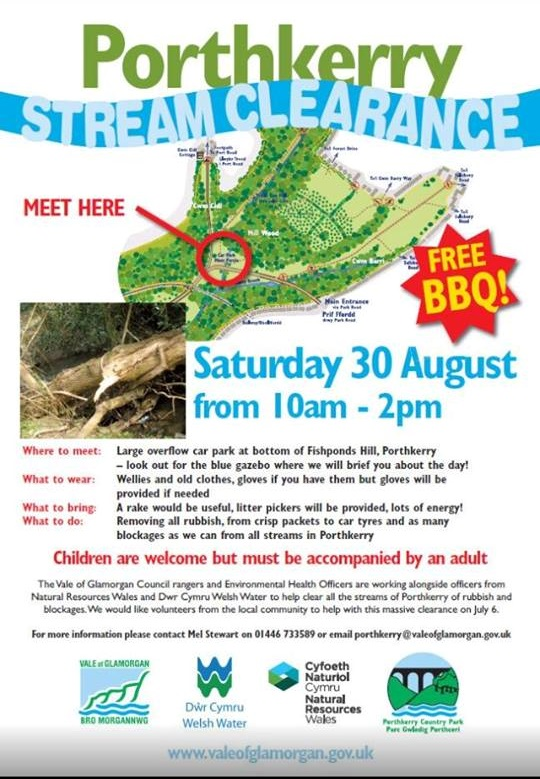 For our next event, Cardiff Rivers Group will be helping out with a stream clearance in Porthkerry Park, Barry. The event was spotted by Adrian (who lives in Barry) and this gives us a great opportunity to branch out in the South Wales area. We will all be participants in this event and we’ll be leaving the organisation of the day to the Vale of Glamorgan rangers, Welsh Water and Natural Resource Wales. The whole event is scheduled for 4 hours but just come along for as long as you want. For those able to stay for the whole duration, there is a free barbecue afterwards. If anyone fancies a pint, the Blue Anchor is a good shout. As this is someone else’s event, they will be providing most of the tools and equipment though Dave will be bringing some waders along for those who like getting wet.